A corn, or foot corn, is scientifically referred to as a heloma. While the term corn is often times used in place of the term callus, it is important to note that they are different. Perhaps the greatest distinction between the two is the location in which they typically form. 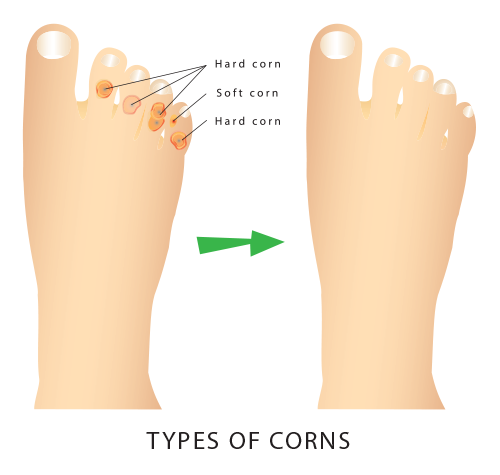 Corns usually occur in areas of little pressure or non-weight bearing areas, such as on the tops and sides of toes and typically have a hard center surrounded by tender skin. They can be painful when pressed and result in a dull ache. Calluses refer to areas of hardened skin that occur in weight-bearing areas, such as the soles of feet, and arise as a result of pressure and friction. Another distinction between corns and calluses is the size and shape. 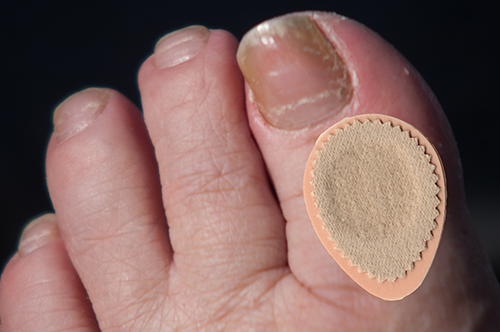 Corns are localized areas of thickened skin, usually circular-cone-shaped whereas the callus is larger in diameter and appears more flattened and diffused across the sole of a foot or palm of the hand. The board-certified podiatrists at American Foot and Leg Specialists are experts in identifying the differences and will diagnose your problem quickly. Hard Corns: are the most common type of corn located on toes and usually developed due to poorly fitted shoes. The anatomical structure of the toes, which tend to curve downward, forces the tops of the toes (at the joint of the toe) to the top of the toe box of the shoe and a hard corn develops due to this pressure. Soft Corns: are found between the toes, more often between the fourth and fifth toe. Unlike the normal, flesh-colored hard corns, a soft corn is whiter and softer in appearance due to the continuous softening by sweat. The single largest cause of toe corns is ill-fitting shoes. Shoes that are too small, too tight, and/or have a narrow, elongated toe box result in extra pressure on the joints of toes where corns tend to develop. Other foot conditions such as bunions and hammertoe tend to increase the odds of developing corns due to over-compensating for pain which results in added pressure on the rest of the foot. Pre-existing foot deformities can also result in added pressure to an area of the foot and cause corns. Our physicians at American Foot and Leg Specialists offer several options for treating corns. The first assessment would be to make sure that you are wearing properly fitted shoes to reduce pressure on the joints, which would thereby reduce the occurrence of corns. Addressing this problem can be all it takes to get rid of the corns, oftentimes causing them to disappear within two weeks. It is sometimes necessary to take other measures. Such measures include using medicated pads or salicylic acid that pares the corn. One can also use an exfoliating foot cream that can be applied to the corn. The foot cream can be applied liberally and worn overnight to moisten the hard corn which is then easier to remove with a coarse brush or towel. Patients with diabetes should allow one of our physicians at American Foot and Leg Specialist to evaluate and assess the condition accordingly.